Early expeditions to the North Pole were difficult, if not impossible, to verify. The generally accepted claim that Robert Peary’s 1909 expedition was first to arrive at the Pole remains somewhat in doubt and, even today, the 1926 over-flight of the Pole by Richard E. Byrd is questioned by some. However, for better or worse, a trip to the North Pole is now available to anyone with a well-loaded credit card. While the Magnetic North Pole is currently situated near Ellesmere Island in northern Canada, the Geographic North Pole is located at 90°N – the top of the world – on a frozen section of the Arctic Ocean. The North Pole is a warmer, somewhat friendlier place than the frigid South Pole. Winter temperatures at the North Pole can range from about -15°F to -45°F, but summer (June – August) temps sometimes reach a balmy 32°F. During the winter months, there is 24-hour darkness, while the summer months enjoy 24-hour daylight. Consequently, tourist cruises, flights, and most expeditions take place during the summer. If you plan to take part in an extended skiing expedition, however, you’ll depart earlier in the season. 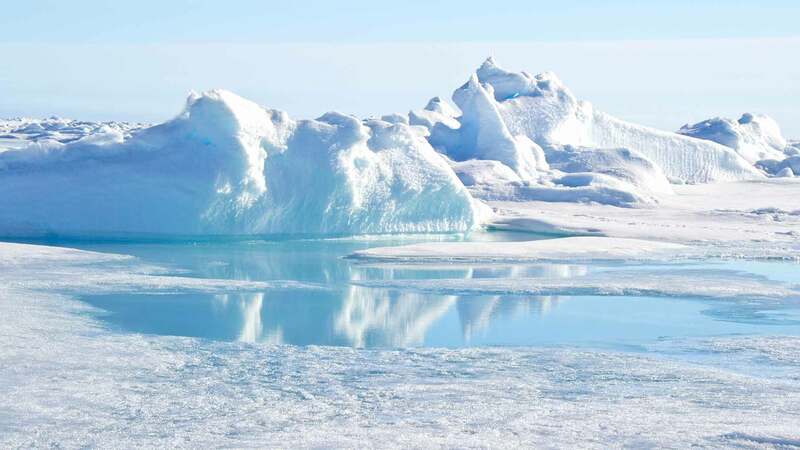 The Arctic Ocean beneath the North Pole is about 2.5 miles deep; the ice floes at the Geographic North Pole average between 7 to 10 feet thick. If you will be flying to the North Pole, you’ll most likely leave from Longyearbyen, the capital of Svalbard, on the island of Spitzbergen, Norway. If you choose to go through a Russian tour company, you’ll fly to the North Pole from Moscow. If you plan to travel to the North Pole on board a nuclear icebreaker, you’ll leave from Murmansk, Russia. You’ll fly from the United States to Moscow first, and then either fly or take the train to Murmansk. There’s a new, budget airline in Russia with fares to Murmansk for under $200. While all icebreaker cruises leave from Murmansk, some Finnish companies depart from Helsinki, Finland. The flight from Helsinki to Murmansk is included in the cost of the cruise. Depending on the travel package and company you choose, you may have to bring your own cold weather clothing and gear, or the company may provide you with everything you need, from long underwear to skis and poles. You can find flights to the North Pole through American, Norwegian, British, or Australian guide services, flying out of Longyearbyen, or Russian tour groups, flying from Moscow. All tours land on the blue ice runway at the Russian research base, Ice Station Borneo, located at 89°N. You fly to the Borneo Ice Station, have lunch and dinner in the dining tent, and sleep in heated “accommodation tents” (with bunk beds). The next day, you have a 35-minute helicopter flight to within 3-5 km of the Pole. Your group skis “slowly” for 3 hours to the North Pole where you set up camp and spend the night. The next day, a helicopter picks you up and returns you to Borneo for a champagne lunch, followed by your plane flight back to Longyearbyen. Cost: $24,750 to $26,800. Your first day is spent at the Borneo Ice Station, getting used to your equipment and skis. You will sleep in expedition tents, but will be close to Borneo where you can pop in for a hot cup of tea in the dining tent, if you’d like. The next day, a 30-minute helicopter flight takes you within 10-15 km of the North Pole. Your group will ski about 6-7 hours, set up camp, and sleep in tents on the ice. The next day, you’ll continue to ski, reaching the Pole by afternoon. You camp there overnight, make a satellite phone call to a loved one, build a snowman, etc. and you’re picked up the next day and flown, by helicopter, back to Borneo for a champagne dinner. You leave that evening by plane, for Longyearbyen. Cost: $27,250. (5 days/4 nights on the ice) – You fly to Borneo and then take a helicopter to within 40-50 km of the Pole. Each member of the group pulls a lightweight sled loaded with a small amount of supplies. This trip gives skiers a great North Pole adventure ski experience, but distances are much shorter and the pace is much easier than in longer, more serious expeditions. You will sleep each night in expedition tents, but your food is of a higher quality and your exposure to the cold during the day isn’t as intense. The entire trip has a rather lighthearted feel to it. You are guaranteed an overnight campout at the Pole, along with a satellite phone call and a group snowman construction. The next day, you fly by helicopter back to Borneo for champagne and a celebratory meal, followed by an evening flight to Longyearbyen. Cost: $28,560. (12 day trip; 9 days on the ice) – This trip is identical to the trip described above, except that you ski from the Borneo Ice Station (89°N) to the North Pole, a distance of 69 miles, over 7 to 8 days. You will haul heavier loads and the expedition requires better physical conditioning, skill, and stamina. All equipment, clothing, food, etc. is supplied by the tour company. Cost: $29,300. (23 day trip; 22 days on the ice) – Some tour companies call this their “North Pole Extreme” trip. You meet your guides and group in Longyearbyen, where you are outfitted with gear. Included in the price of your trip are tents, sledges, stoves, fuel, skis, boots, poles, backpack, major expedition clothing (windproof insulated coats, head and hand gear, pants, etc. ), and much more. The expedition clothing and backpack will be yours to keep. Also included in the cost is the use of a satellite GPS, a 2-minute satellite phone call to a loved one, your professional guide, all food while in Antarctica, ski lessons, and many more services. Cost: $27,850 to $30,200. You fly to Ice Station Borneo where you board a helicopter and fly south to 88°N – approximately 138 miles from the Pole. Each member is harnessed to his or her own heavily-laden (85-110 lbs.) sled. Depending on the structure of the trip, you will spend anywhere from 8 to 20 days on the Arctic ice, living from the supplies you have brought along. You will have no outside support. Teamwork is essential to the success of this trip, and everyone helps out with cooking, route finding, and watching out for polar bears. You will experience complete isolation until you reach the North Pole. Once there, depending on weather and timing, you may camp overnight before a helicopter arrives to take you back to Borneo. After the 40-minute flight, there will be a champagne ceremony. You may spend the night at Borneo (hot meals and warm bunks) before flying back to Longyearbyen. (Unsupported) – Even for $15,500, you are very much on your own on this trip. The company will fly you from Moscow to Ice Station Borneo. You, however, are responsible for all your own supplies, sleds, fuel, food, stove, radio, etc. If you feel you need a guide, the company can supply one for an extra fee. Starting date should be between April 15 – 18, and the company allows you 5 to 7 days to ski to the Pole. They will eventually send a helicopter to fly you back to Borneo. While you’re on the ice, you must supply your own support group (doctor and radio operator who stay at the ice station). In fact, the company suggests that you bring along “a friend or girlfriend to control your movements along the route.” Cost: $15,500. For those who want to truly test themselves in the Arctic, one of the most extreme North Pole expeditions attempts to cross the Arctic Sea, from Siberia to Canada, on skis. You will have to find your own sponsors for this trip – no commercial company offers it. Cost: $25,000+. Short of that, there are expeditions originating in Canada (Ward Hunt) and Siberia (Cape Arktichevsky) that attempt to ski the 480+ miles to the North Pole. You are advised to start no later than the beginning of March. You can choose one of two styles for your attempt: “autonomous” (you haul everything with you on sledges) or “merciful” (you haul a limited amount of food, fuel, and supplies, and the rest is delivered by helicopters or parachuted from aircraft as needed). Either way is extreme and dangerous. Route-finding is a challenge, and the list of hazards, from terrain to polar bears, is intimidating, to say the least. Depending on the amount of support you require, this trip could cost at least $25,000 per person – much more if you require search and rescue – and you must purchase all gear, food, clothing, fuel, and supplies separately. Powered by a 75,000 horsepower engine, the Russian icebreaker Yamal is the very latest in ice breaking technology. The ship leaves from Murmansk, Russia, and is the only icebreaker currently taking tourists to the North Pole. $23,000 to $39,000 depending on occupancy (standard, double, private) – These 16-day trips (mid-June to early August) leave from Murmansk and cross the Barents Sea, breaking into Arctic pack ice up to 5 meters thick. You’ll see polar bears, walrus, beluga whales, sea birds, and other wildlife, and helicopter tours are available from the ship. Once you get to the Pole, you’ll have the opportunity to explore a bit and then return via Franz Josef Land, an archipelago of 191 mostly unexplored islands. $23,000 to $39,000 depending on occupancy (standard, double, private) – This is the same trip as above, for the same price. However, this trip leaves from Helsinki, Finland. Round trip flights from Helsinki to Murmansk are included in the price. Both trips include either a 5-day dog sled training course in Minnesota in January, or a 3-day dog sled training course in Longyearbyen just prior to the expedition. The cost also includes guides, food, a satellite phone call home, and all group gear. You are responsible for your own cold-weather expedition clothing and gear: skis, boots, poles, sleeping bag, etc. Everyone helps drive the sleds, prepare food, set up camps, and care for the dogs. Once you arrive at the North Pole, the group celebrates with champagne, pictures, and an overnight campout. The next day, you’re picked up by helicopter, returned to Borneo Ice Station, and then flown back to Longyearbyen. Because the Borneo Ice Station is a Russian station, Russian guide companies take advantage of its blue ice runway and relatively “civilized” accommodations, offering a unique variety of North Pole experiences. North Pole Adventures, under the management of director Sergei Insarov, sponsors the following one-of-a-kind events. The price covers all expenses Moscow to Moscow, with a choice of intermediate points along with way: Murmansk, Archangelsk, Vorkuta, Norilsk, Khatanga, or the archipelagos. This is not your choice, though – the organizers choose the stop-off points, depending on weather and convenience factors. You will be flown to the ice station and then, if all goes well, you will continue by helicopter to the North Pole. Your “guides” will use a GPS to locate the Pole, drive a stake (“terrestrial axis”) into the ice at that location, surround it with flags representing all participants of the current tour, and then photograph you “hugging” the axis. You will then be served vodka, champagne, sandwiches, vegetables, and fruit. They caution, “Everything but vodka freezes quickly, so toasts should be short.” After 2 to 4 hours, you return to the ice base, board your plane, and immediately leave for Moscow where you’ll have a banquet and be awarded a North Pole visitation certificate. However, NP Adventures mentions that delays at the ice station can occur for various reasons, in which case you will be accommodated in warm tents, and tea, coffee and hot food will be made available. For a truly unique honeymoon experience, this trip covers your Moscow to Moscow expenses and offers double-occupancy in a tent either at the North Pole or at the Borneo Ice Station for any length of time between April 10-25. “Food, drinks, and privacy” are included in the cost. If you’d like this experience but are not married or married before 2007, the cost is $29,500 (per couple) for a one week stay. Cost: $14,750 (per couple) for April 2008 newlyweds; $16,200 if married earlier in 2008; $26,500 if married in 2007. Ice Sculpture Festival – Cost covers all expenses Moscow to Moscow. You and other sculptors will stay 3 to7 days at the North Pole. Ice and snow blocks will be pre-cut for you, and you may choose the location for your sculpture. Accommodations are warm tents and dinners. At the end of the week, a new group of tourists arrives, and will photograph your sculpture “for posting on the Internet!” Returning from the North Pole, your plane will stop in the Russian town of Khatanga, where you are asked to participate in group ice sculpture projects for the local population. You and nine other passengers take turns at the controls of a Antonov-2 biplane for a 5-minute “around the world” flight, supervised by an NP Adventures co-pilot. North Pole Adventures calls this their Plus-minus 40 Degrees trip, “for those who can appreciate hard drinks not freezing even at minus 40 degrees Centigrade.” Your group will be flown from Moscow to the Borneo Ice Station and then on to the North Pole, where you will have the once-in-a-lifetime opportunity to drink as much vodka as you possibly can at the top of the world. Pickled cabbage and other vodka-appropriate snacks are served. Your “guides” will then help you back onto the helicopter for what may prove to be a truly nauseating 40-minute flight back to Borneo. Once there, you vomit copiously, board your plane, and return to Moscow, with a world-class hangover and a sheepish grin on your face. Advertised for “Europeans and people all over the world,” this promises to be a highly social polar experience. You and 154 others leave in a big jet from Frankfurt, Germany. Passengers are then shuttled, by helicopters, to the Pole and back. Much vodka is served, many pictures are taken, and the terrestrial axis is enthusiastically hugged. North Pole Adventures proves its creativity and we’ll-try-anything nature by offering free passage to the North Pole to anyone who can provide them with at least ten full-paying customers.